Coordonnateur : Haight Joel M.
Loss prevention engineering describes all activities intended to help organizations in any industry to prevent loss, whether it be through injury, fire, explosion, toxic release, natural disaster, terrorism or other security threats. Compared to process safety, which only focusses on preventing loss in the process industry, this is a much broader field. Here is the only one-stop source for loss prevention principles, policies, practices, programs and methodology presented from an engineering vantage point. As such, this handbook discusses the engineering needs for manufacturing, construction, mining, defense, health care, transportation and quantification, covering the topics to a depth that allows for their functional use while providing additional references should more information be required. 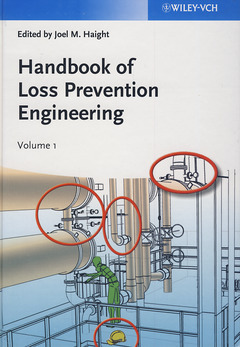 The reference nature of the book allows any engineers or other professionals in charge of safety concerns to find the information needed to complete their analysis, project, process, or design.